A mechanical device used to elevate the axle of vehicle so that one tire is raised off the ground, enabling one to access and change the tire. Most cars have a relatively small, manual jack stored in the same compartment as the spare tire. 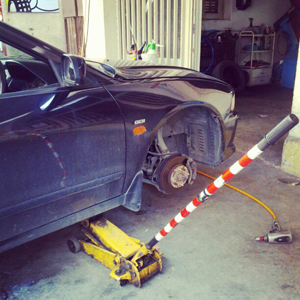 Professional mechanics often use a larger, hydraulic jack, and in commercial car garages there are often electric pallets that lift the whole car for complete access to all four wheels at the same time, as well as to the underside of the car's body. "Tire change, featuring manual hydraulic jack, December 15, 2012" by Leonid Mamchenkov.